Endermologie is great for detoxification, fluid drainage, skin firming and the treatment of cellulite. Overall wellness is achieved as a consequence of increased blood flow to organs and increased lymphatic drainage, to assist in the excretion of toxins. Endermolgie re-balances the body and increases general energy levels. For detoxification, to increase energy levels, and for relaxation, a single session can be enjoyed. Many people choose to have endermologie weekly as part of a general wellbeing regime. If undertaking endermologie to achieve a result, individuals should be assessed to determine the number of treatments their body will require. Cellulite treatments, body shaping and skin firming may range from 10 to 30 sessions. The number of treatments depends upon the requirement of the person. In general cellulite will take 10-15 sessions. Skin firming varies according to age and gender and takes 15-20 sessions. by America's Food and Drug Association (FDA) for permanent cellulite reduction. Over time our bodies accumulate toxins from pollutants, detergents and busy inner urban lifestyles. Toxins are stored in our subcutaneous fat layer. These Lipocytes (fat cells) store the toxins and enlarge, blocking vital blood supply. Ever wondered why we get cold bottoms and feet? This blockage limits the body's ability to drain wastes and toxins effectively, causing a build-up in the cell. Once blocked the skin loses its tone and texture resulting in an 'orange peel' skin tone. Endermologie acts to increase blood supply to the entire body with its patented gentle sucking and rolling action. The suction increases the volume of the area in the connective tissue by creating space between the cells and releasing the trapped blood vessels. The rollers then act to gently push the wastes back into the lymph, so that they can be excreted by the endocrine system. Endermologie often results in extra urination while your body is clearing. We strongly recommend you spend 25min in the detox box immediately following your treatment to sweat out released toxins and stored fat. The detox box is free with all endermologie packages. You must drink several litres of water per day while undergoing endermologie treatments to help flush toxins from the body. Apart from body shaping and cellulite, Endermologie is an incredibly powerful treatment with far reaching benefits for other conditions; scar tissue, sore joints, trauma. Pollution, over exposure to the sun and an unbalanced diet cause premature aging of tissues and a slowing of cellular activity. Endermologie stimulates fibroblasts to produce more collagen and elastin; both vital for skin tone but which our bodies normally cease to produce at around 25 years of age due to hormonal change. You will notice your skin tone improve after only a few treatments. The action of the treatment breaks fibrotic barriers up, increasing blood supply to transport nutrients and remove wastes. Scarring results in decreased tissue movement which leads to an excess fat accumulation around affected areas. Endermologie stretches and breaks down the fibrosis, freeing adhesions and giving rise to increased circulation and movement. It works effectively by lifting skin without traumatizing or pinching the area. Infrared waves penetrate deep into our body for a deep heating action which allows for the body to activate the sweat glands. The sweat glands offer one of only a few mechanisms that the body has to eliminate toxins and since the skin is the largest organ in the human body it is apparently a very good means for elimination. It is also believed that infrared waves help improve blood circulation and recovery from fatigue. Infrared heaters warm the body in the same manner as natural sunlight. Traditional saunas raise the temperature of the air to a very high level within the chamber to warm the body. Some people have difficulty breathing in this extremely warm air. Infrared saunas work differently. Instead of heating the air within the enclosure, infrared saunas heat the body directly. The result is deeper tissue penetration. 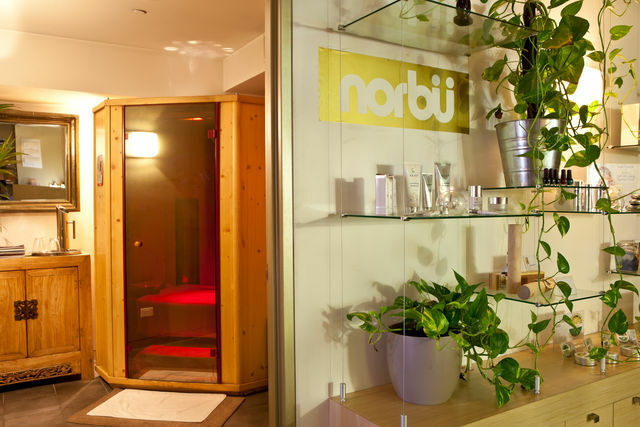 In the infrared sauna, the body perspires and receives all of the healthy benefits but avoids the harmful and extremely hot air of a traditional steam sauna. What are the benefits to this type of heat? Heat improves circulation, expels dirt & chemicals and removes dead cells on the surface of the skin. This makes it ideal for detoxification and can boost your immune system. Increases blood circulation and strengthens your cardiovascular system. The high temperature helps lower blood pressure and increase blood circulation. It gets your heart to beat faster, and it burns calories as it raises your metabolism a little bit. The heart rate increases as more blood flow is diverted from the inner organs towards the extremities of the skin without heightening blood pressure. Many people will use infrared saunas before a massage or before a serious work out to heat up their muscles and ligaments. LED Light Therapy is a painless, non-invasive treatment, which is suitable for all skin types. The treatment simply involves relaxing under the lights for 20 minutes, and can be done as a standalone treatment for antiaging or to optimise facials, microdermabrasion, peels, contour facials and endermologie facials. LED stands for light emitting diodes- tiny bulbs which emit non-thermal specific wavelengths of light from the visible spectrum into the dermal layers of the skin. Initially discovered by NASA; while experimenting with growing plants in space, astronauts were shocked to discover that upon returning to earth, the normal injuries associated with being an astronaut healed much faster after being exposed to the LED lights. This led to additional research being conducted on the capabilities of LED in wound healing and medical practices, and inevitably its anti-ageing and skin rejuvenating abilities. Sensitive and inflammatory conditions: rosacea, eczema, psoriasis, post treatment healing and scarring. All skin types are suitable for LED Light Therapy, as it is a completely non-invasive treatment and has no contra indications or adverse side effects. So how does LED work? The tiny bulbs emit specific colour wavelengths, which penetrate the skin at varying depths. Much like photosynthesis in plants, the skin absorbs the energy from the light, transferring light energy into cell energy. This stimulates the fibroblasts in the skin; the cells responsible for producing collagen and elastin, which are in turn responsible for plump, firm, and line free youthful skin. Blood circulation and oxygen flow are increased, and toxins are released, making the treatment great for problematic skins. On average, cells regenerate 150% to 200% faster after an LED treatment, and hydration can be increased by up to 600%. As the treatment is a progressive, rather than aggressive treatment, a course of treatments is recommended for optimal results. Over a course of treatments, the skin builds resistance to ageing and external factors. Skin feeling a little dull, dry, rough, or just needs a bit of an extra boost? Come in for a session of Microdermabrasion! 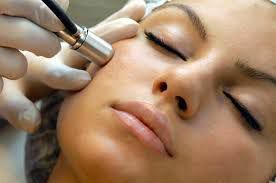 Microdermabrasion is a great way to give your skin a thorough exfoliation, without damaging. The procedure is simple, and fairly pain free. The machine uses two functions to make your skin look and feel great – diamond dust heads are used to gently buff away dead surface skin cells, this is combined with suction that gently lifts the skin and remove dead skin cells right off your face. The treatment works only on the very surface layers of the skin, meaning that the dull dead skin cells are completely removed, leaving fresh beautiful healthy skin cells behind. Post treatment, there is very little down time; skin may have a slightly pink glow, and feel warm to the touch for a few hours afterwards, however normal activities can be resumed straight away. You will see results after the first treatment; however the most dramatic results will be seen between 4 – 6 treatments. We recommend having these treatments spaced 7 – 10 days apart if doing a course, after which maintenance treatments can be done once every 4 – 6 weeks. Responses vary from person to person, but the treatment is often described as feeling similar to the sensation of a cat liking the skin – gentle, but slightly rough. What is involved in a Norbu microdermabrasion facial? The treatment would start off with a gentle double cleanse, after which one of our skin specialists will look at the skin, doing a thorough consultation to find out what the client is wanting to achieve, and if microdermabrasion is the going to be the best treatment to achieve the desired results. Next the skin is prepared for microdermabrasion, by doing a light exfoliation of the skin, using our organic product range, followed by the microdermabrasion treatment itself, which is typically 10 – 15 minutes on the skin. Once the whole exfoliation process has been completed, we take the opportunity to greatly heal and hydrate the skin. LED light therapy is used for 20 minutes directly over the face, as the light penetration is significantly enhanced after a thorough exfoliation process such as microdermabrasion. After this process, a beautiful healing and hydrating mask is applied, and once removed the treatment is finished with the appropriate moisturiser and eye cream, leaving the skin looking and feeling lush and beautiful. We recommend clients who are going to undergo microdermabrasion to be on a full home care routine, as this will greatly enhance the results you will achieve from the treatment, whether as a one off, or as a treatment plan. For those clients who may not be using homecare, our fully qualified therapists are happy to recommend appropriate home care. There is no doubt that the market for slimming and cellulite reduction is on the increase, and finding a system that’s both safe to use and produces results every time isn’t easy. Wear Nothing have developed the Contour+ which combines infra-red light, RF, and vacuum/massage to literally melt away the fat and cellulite. In addition the combined effects of these technologies have a remarkable effect on smoothing out wrinkles and bags under the eyes allowing us to offer a range of treatments from one machine. Vacuum + Massage rollers accelerate blood circulation and increase blood flow to drain excessive water and body waste. The DermaPen Medical is a safer and more effective way of piercing the skin due to its unique vertical needling technology. The DermaPen Medical works to improve collagen and elastin rejuvenation through applying active ingredients to the deeper layers of the skin. The DermaPen Medical has many beneficial features including multi-speed and adjustable needle depths which assists in reducing pain and patient recovery time. The DermaPen Medical allows scar-less healing and the natural reproduction of collagen. The DermaPen Medical allows for a lower cost, shorter treatment times, no side effects and, importantly for professionals, is portable.